Sydney Young with Swans defender Alex Johnson at Patersons Stadium last July (image from The Weekend West). The Sydney Swans are mourning the loss of former South Melbourne player Sydney Young who sadly passed away on Saturday. 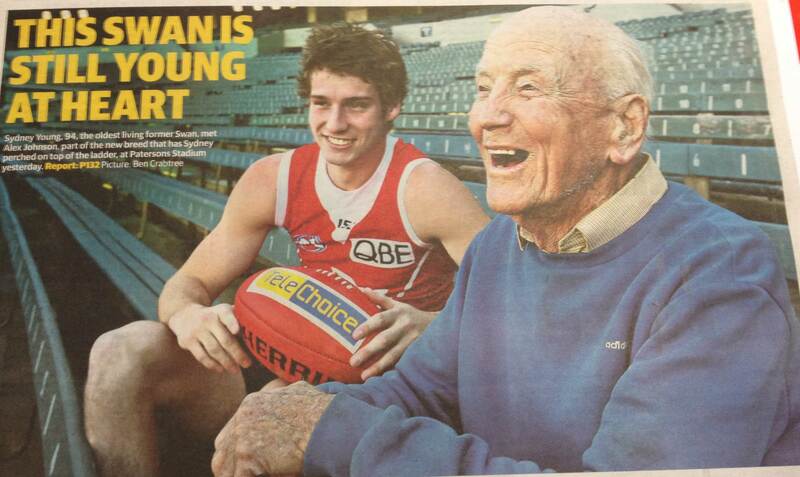 The 95-year-old, who passed away peacefully at his home in Perth, was the Swans’ oldest surviving player. A regular league player for Claremont both before and after World War II, Young played two games for South Melbourne in 1941 while he served at Flinders Naval Base. The first game saw Young play on the wing alongside Brownlow medallist Herb Matthews in a tight win over Collingwood, while his second game was a month later in a loss to Footscray. Upon his return to Western Australia, Young played 100 games for Claremont, captained the club in 1949 and is recognised as a Life Member. In the Swans’ most recent visit to Perth in July last season, young defender Alex Johnson had the pleasure of meeting Mr Young ahead of the team's round 16 clash (pictured above).